1992 marked the quincentennial of Columbus’s ruinous landfall. As state-sponsored anniversaries go, National pride and patriotic excitement was on a high that year. But, so was the critical voice. Natives did what they’ve done since 1492 and resisted triumphant expressions of colonization. Curators and some artists looked to frame many exhibitions with meaning derived from a critical, Post-Colonial context. But not performance artist, James Luna. He viewed the swell of interest in Native Art as a fleeting “gold rush” as he fielded many call from curators suddenly looking for Natives to include in their exhibitions. He said “no” to 1992, refusing most exhibitions he was invited to participate in, with the simple phrase “Call Me in ‘93.” He was effectively asking if anyone would still care the following year. “Call Me in ‘93” has been on my mind lately. Currently, the Guerrilla Girls are in town, a radical artist group that exposes sexism and racism in the arts industry. As part of the Guerrilla Girls Twin Cities Takeover, a year-long residency where the Guerrilla Girls have spotlighted sexism in Twin Cities art institutions, many art institutions and galleries are presenting sympathetic exhibitions that focus on art made by women. 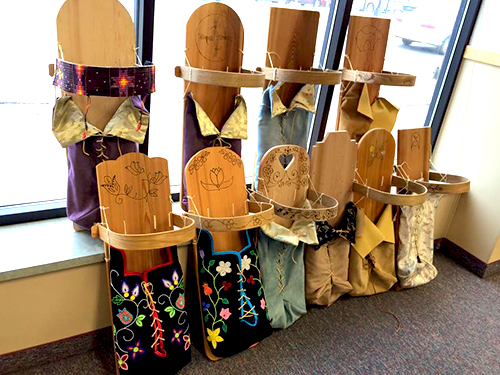 The exhibition ‘Sinew: Female Native Artists of the Twin Cities’, on view at Artistry in Bloomington, is part of the takeover programming. I agreed to be one of the artists in this exhibition, but I’ve been wondering, as James Luna did, will anyone care next year? In the wake of the Guerrilla Girls residency, The Walker Art Center released its plans to expand the Minneapolis Sculpture Garden, adding new works of art and redesigning its grounds. Under the subtitle “A Diverse Collection,” The Star Tribune reported that, “With the new work, women and artists of color will have made about a third of the garden’s art, roughly double their previous tally.” In other words, the Minneapolis Sculpture Garden went from having sculptures by 17% women/POC to a whopping 33%. Furthermore, women and persons of color as a single category is another way of not having to say “white male” artists, who make up the lion’s share of the collection. By not uttering the category “white men” we are affording them the power to make work beyond their experience, they have the authority to not have their ideas bound to the “white male perspective.” It is hard to imagine a show subtitled, “White Male Artists of the Twin Cities.” Exhibitions that specify race and gender is something afforded to women and minority artists. How is all of this related to Sinew? 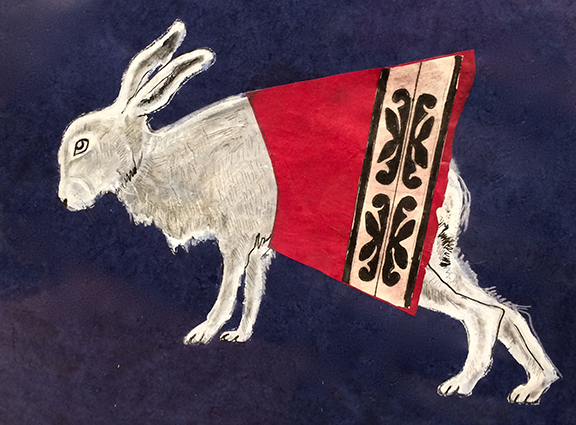 This exhibition might be the first exhibition to exclusively feature female Native artists of the Twin Cities. It might be the very first of its kind. It also may, at first, seem narrow in focus. Specifying a location, race and gender of the included artists brings many assumptions to the table, and one might expect to find a succinct, codified voice. On the contrary, Sinew is rich in materials and defies stereotype. This is a point of pride in the exhibition. Everything is allowed. Firstly, I’ve never been more delighted by a materials list. Secondly, Advice to Myselves is no-doubt an assembled piece of objects that each have their own acknowledged origins, amassed, assembled and inviting activation. This is an investigatory piece that welcomes an empathetic response. The material of Advice to Myself is supported by the film Advice to Myself 2: Resistance by Elizabeth Day, Louise Erdrich and Heid Erdrich. In this film, some of the objects included in Advice to Myselves debut as film props. In this video, Louise Erdrich’s voice gives clear advice along the lines of not coddling loved ones, while the images of a person donned in a bear mask and the above listed winter gear, slumps around a wintery snow bank. 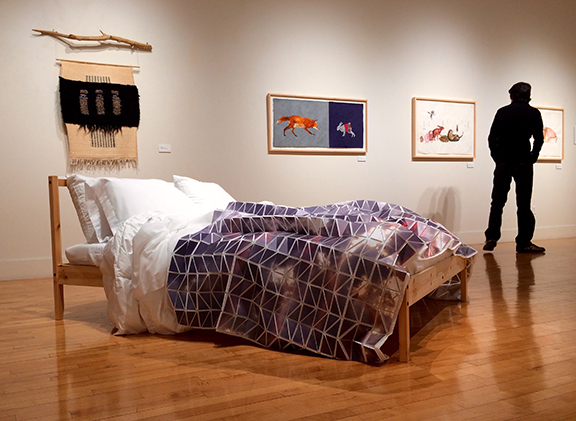 Maggie Thompson’s installation piece, titled Fragments, consists of a bed made up with a quilt of shattered images. The quilt element appears to be created by photographs mounted on foam-core that has been cut into a prism of triangles and adhered to a fabric substrate. Although this presentation of objects might suggests comfort, Thompson’s jagged treatment of the quilt’s surface is sharp and physically threatening. 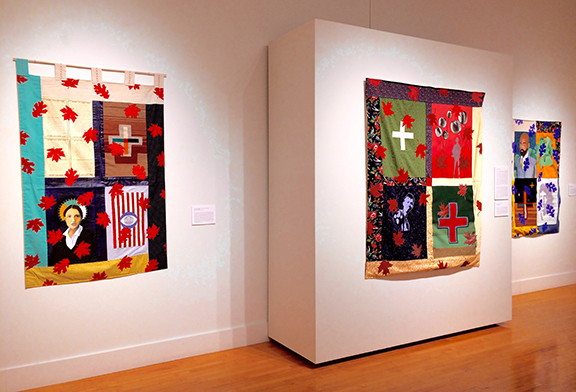 Carolyn Lee Anderson’s mixed media triptych also present an uneasy message atop quilt-like objects. Anderson’s Disillusion/Dissolution #1, #2 and #3 are named after various tree varieties: Silver Maple Northern Red Oak, Valley Oak and Sugar Maple. These are bright objects crown the exhibition. Upon closer scrutiny, images of beautifully painted haloed portraits, G.I.s, legal documents, and National symbols are stitched in, painted over and layered in a brilliant patchwork of memories. Other artists included are Julie Buffalohead, Dyani White Hawk and myself. 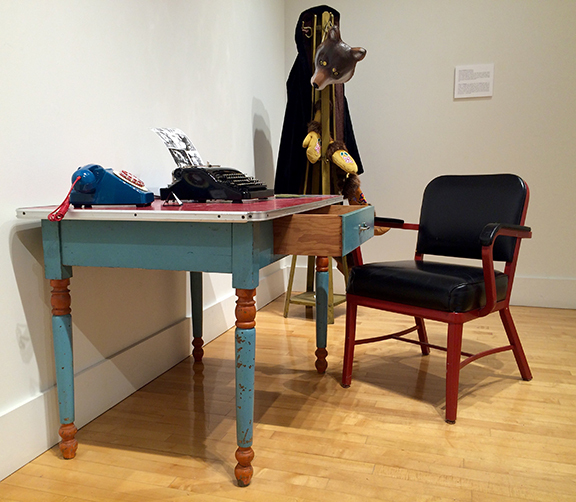 Curated by Dyani White Hawk Polk, the exhibition runs February 12 to April 1 at Artistry at the Bloomington Center for the Arts, in the Inez Greenberg Gallery. 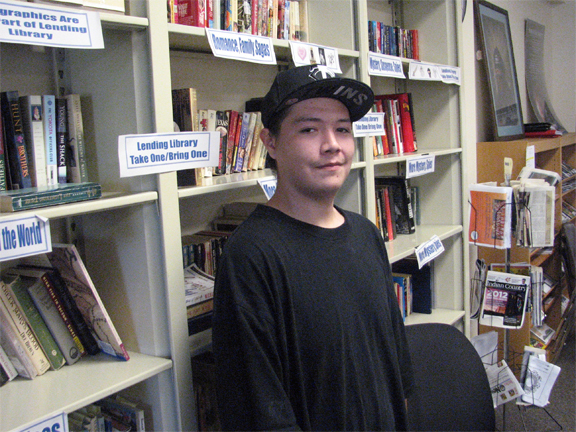 Next articleWho will win the 2016 presidential vote in Indian country?